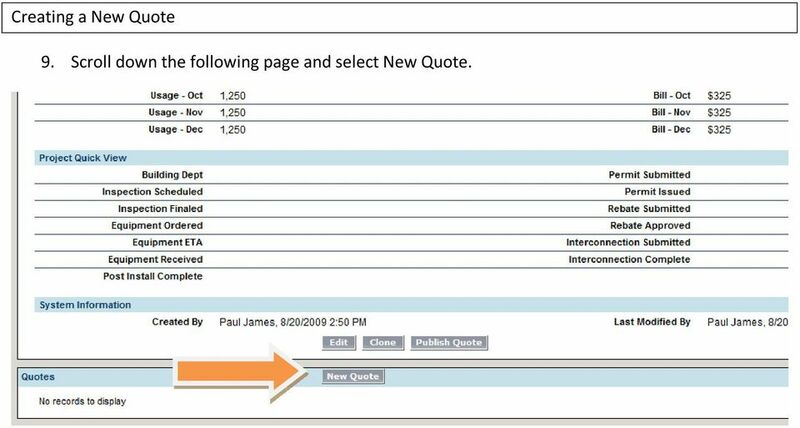 Download "Salesforce Tutorial Quote. Create new Account: 1. From homepage select the Accounts Tab." 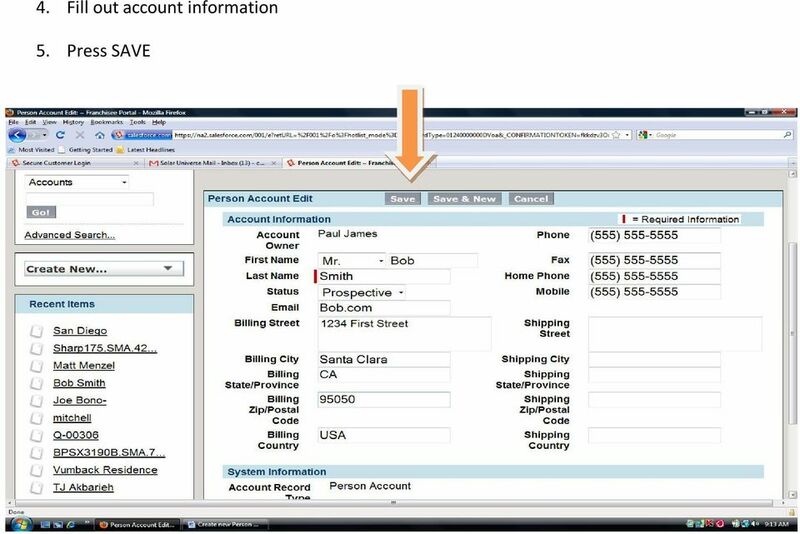 1 Salesforce Tutorial Quote Create new Account: 1. From homepage select the Accounts Tab. 2. From Accounts page select New. 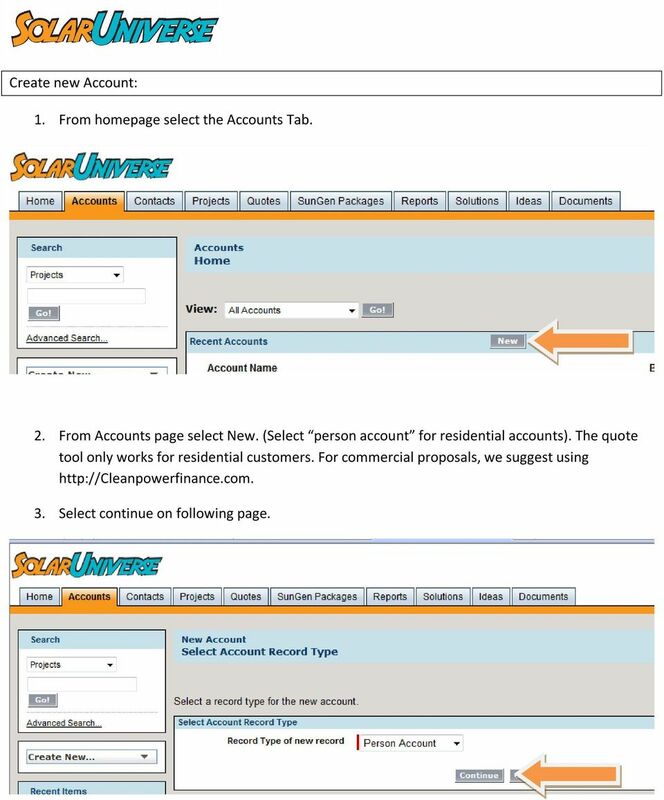 (Select person account for residential accounts). 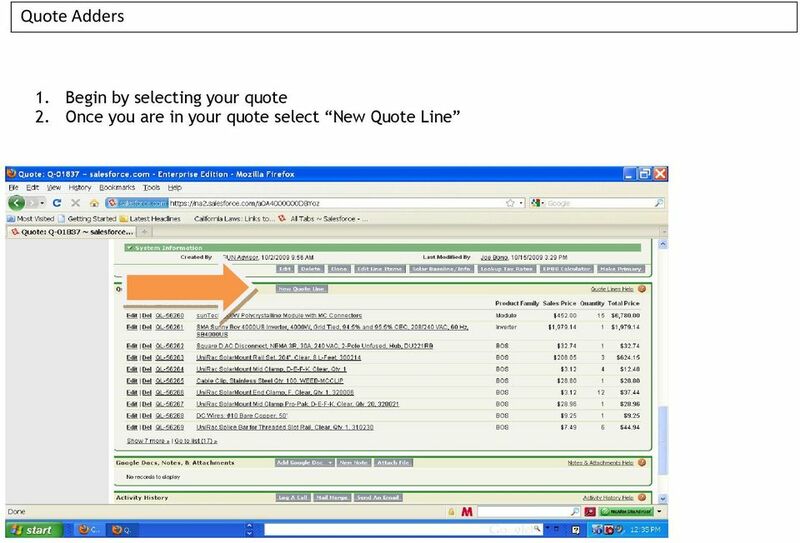 The quote tool only works for residential customers. For commercial proposals, we suggest using 3. Select continue on following page. 3 Creating a new Project 6. 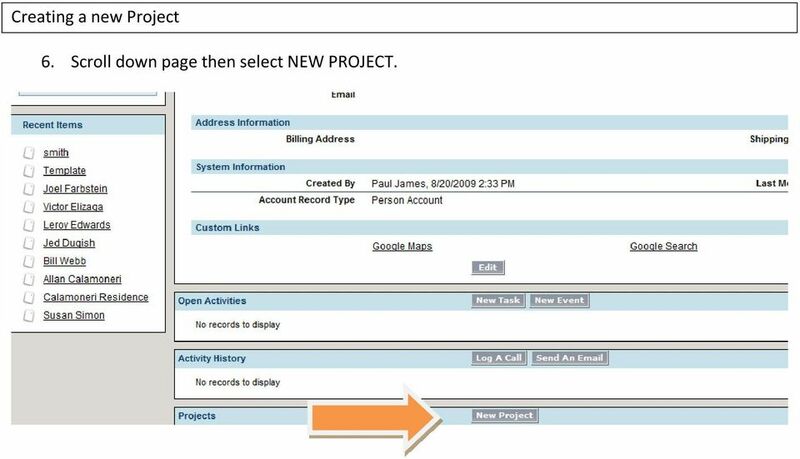 Scroll down page then select NEW PROJECT. 5 Creating a New Quote 9. Scroll down the following page and select New Quote. 6 How to select your SunGen Packages 10. 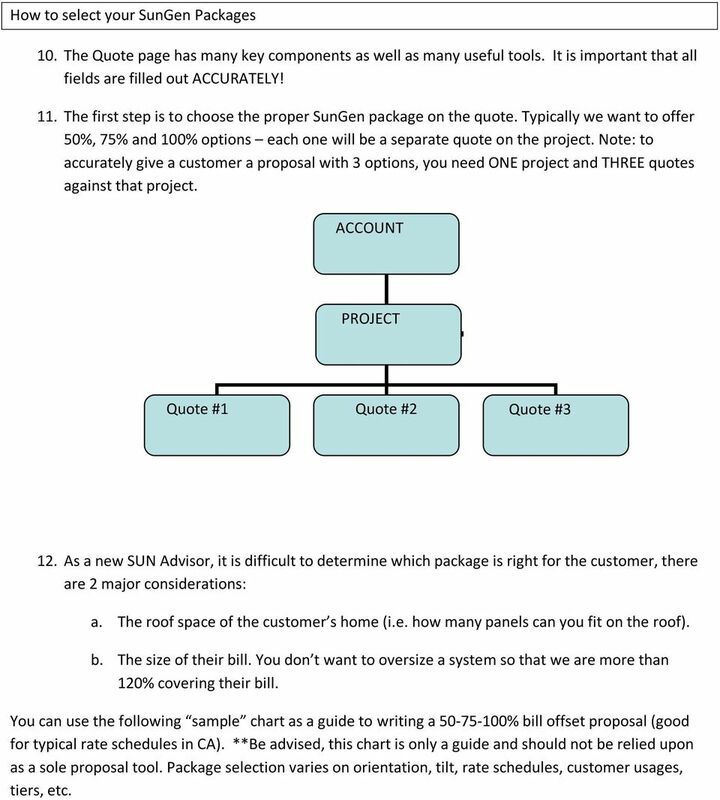 The Quote page has many key components as well as many useful tools. It is important that all fields are filled out ACCURATELY! 11. The first step is to choose the proper SunGen package on the quote. 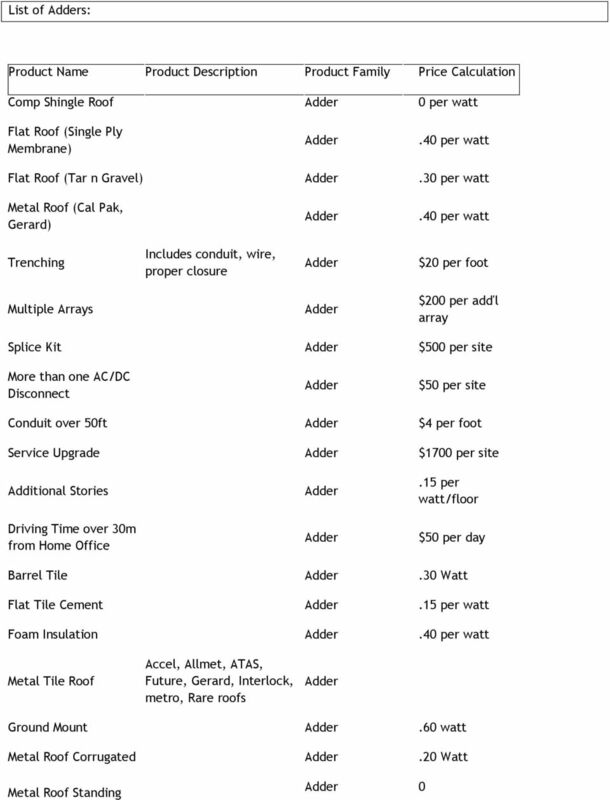 Typically we want to offer 50%, 75% and 100% options each one will be a separate quote on the project. 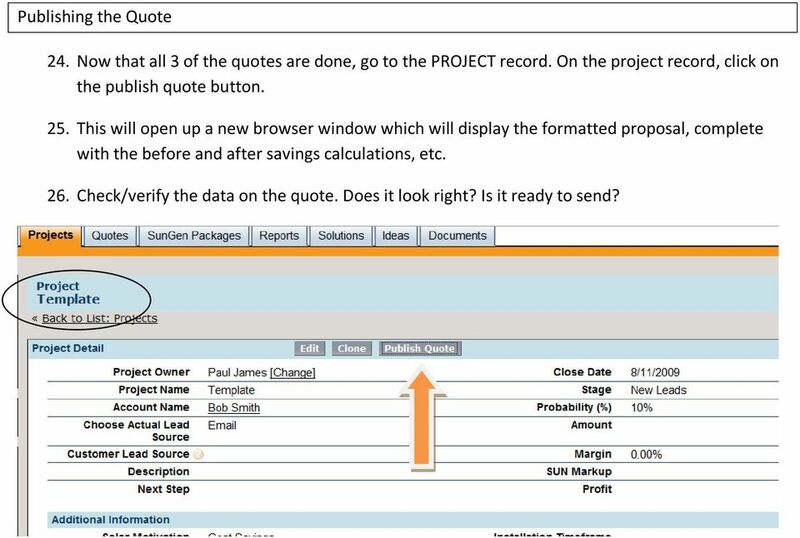 Note: to accurately give a customer a proposal with 3 options, you need ONE project and THREE quotes against that project. ACCOUNT PROJECT Quote #1 Quote #2 Quote #3 12. As a new SUN Advisor, it is difficult to determine which package is right for the customer, there are 2 major considerations: a. The roof space of the customer s home (i.e. how many panels can you fit on the roof). b. The size of their bill. You don t want to oversize a system so that we are more than 120% covering their bill. 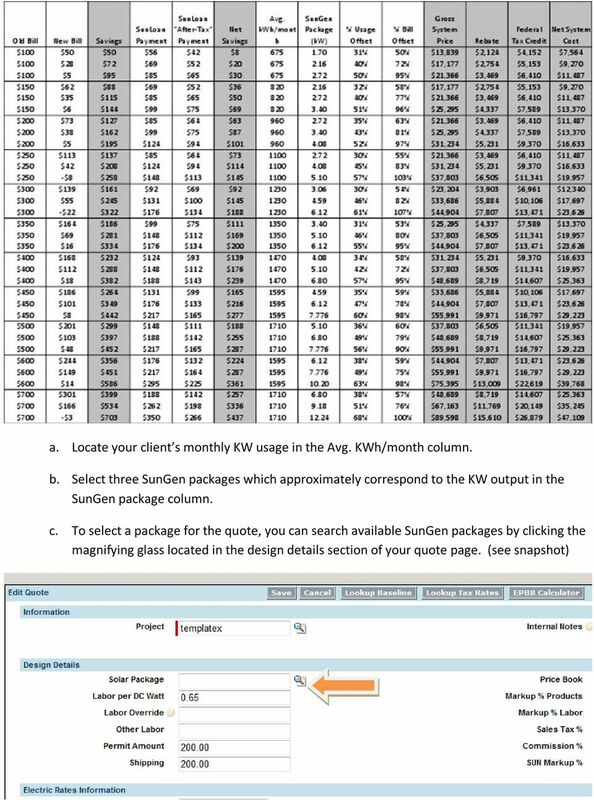 You can use the following sample chart as a guide to writing a % bill offset proposal (good for typical rate schedules in CA). **Be advised, this chart is only a guide and should not be relied upon as a sole proposal tool. 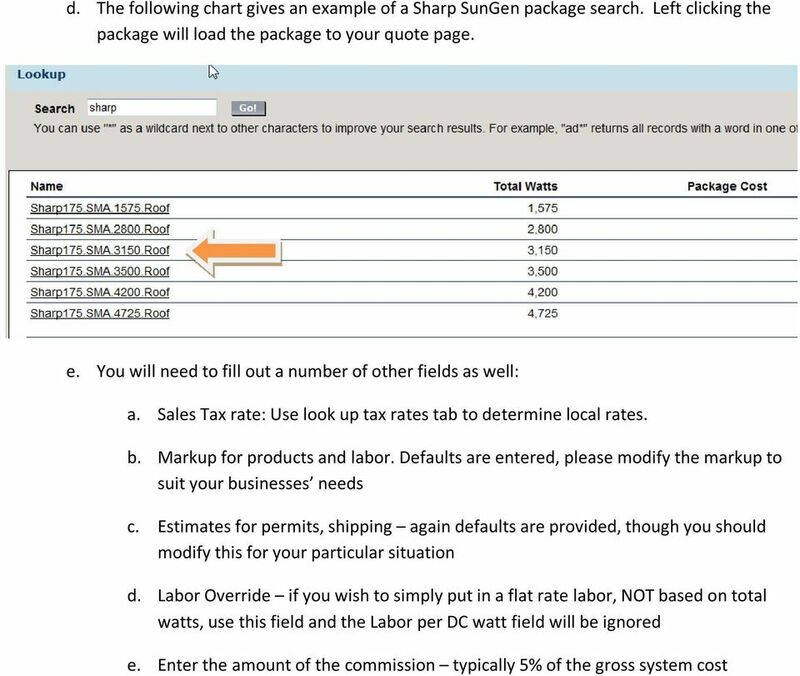 Package selection varies on orientation, tilt, rate schedules, customer usages, tiers, etc. 9 Baseline Lookup 13. Use the lookup baseline tab to determine the proper summer and winter baselines. 14. Select your customer s utility provider. (i.e. 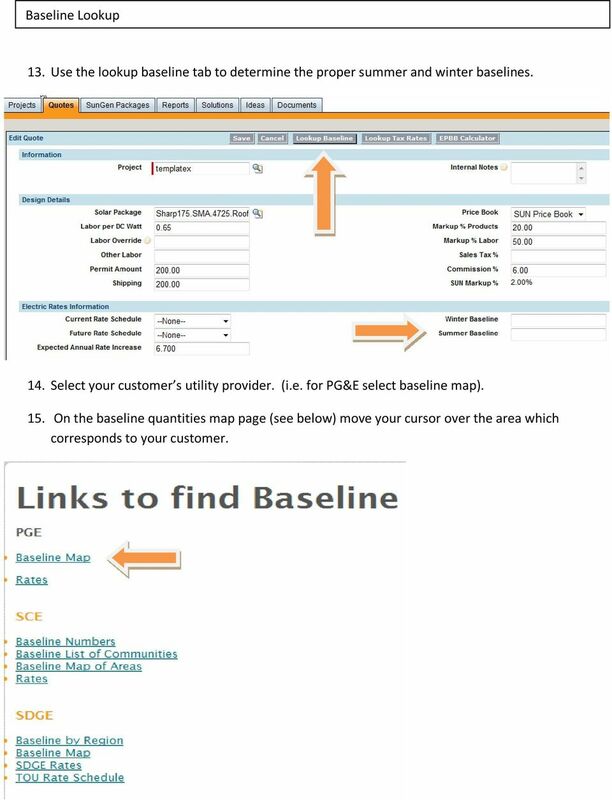 for PG&E select baseline map). 15. On the baseline quantities map page (see below) move your cursor over the area which corresponds to your customer. 10 16. Determine if the utility is gas and electric (code B), all electric (code H), or all gas. 17. Multiply baselines by the number of billing days which can be found on the monthly bill. 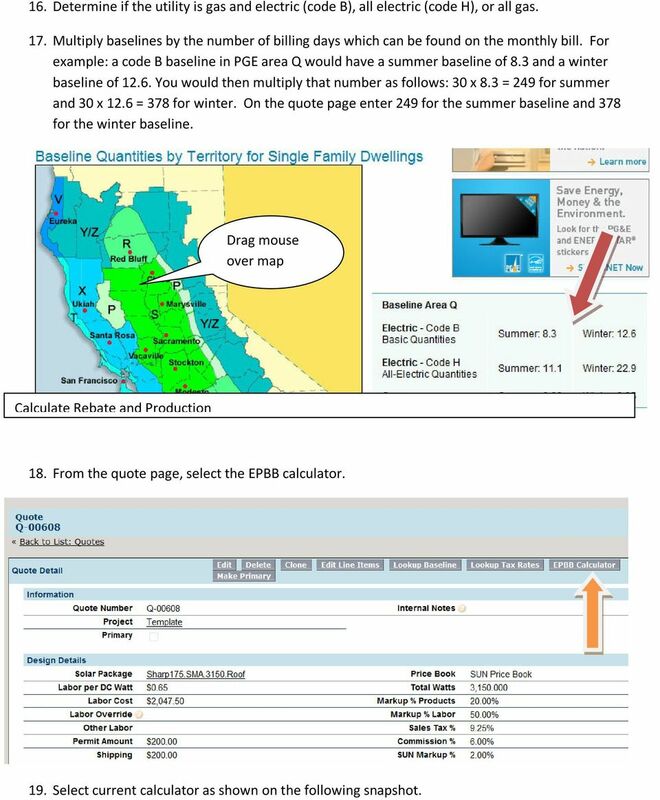 For example: a code B baseline in PGE area Q would have a summer baseline of 8.3 and a winter baseline of You would then multiply that number as follows: 30 x 8.3 = 249 for summer and 30 x 12.6 = 378 for winter. On the quote page enter 249 for the summer baseline and 378 for the winter baseline. Drag mouse over map Calculate Rebate and Production 18. From the quote page, select the EPBB calculator. 19. 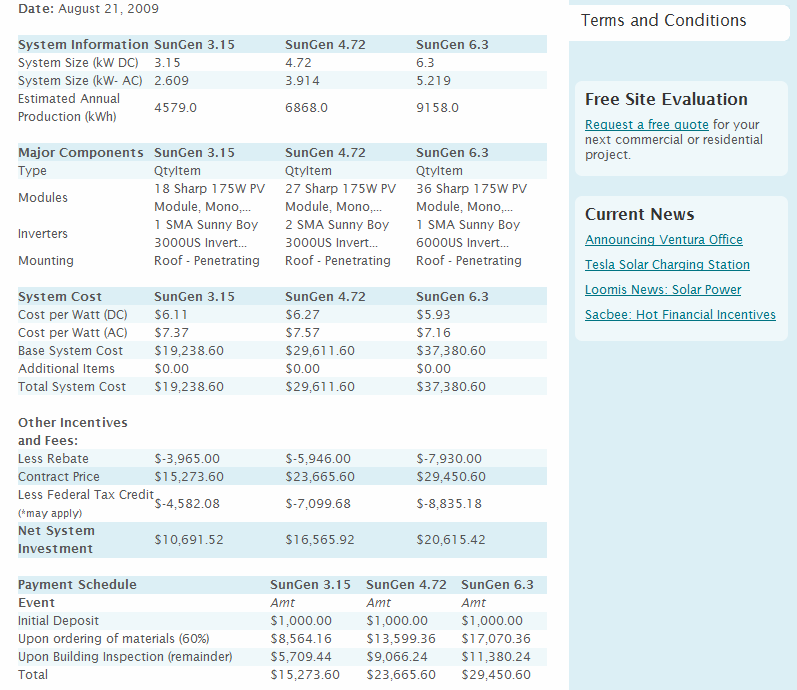 Select current calculator as shown on the following snapshot. 11 20. The screen below, which has a number of useful drop-down lists, will appear. 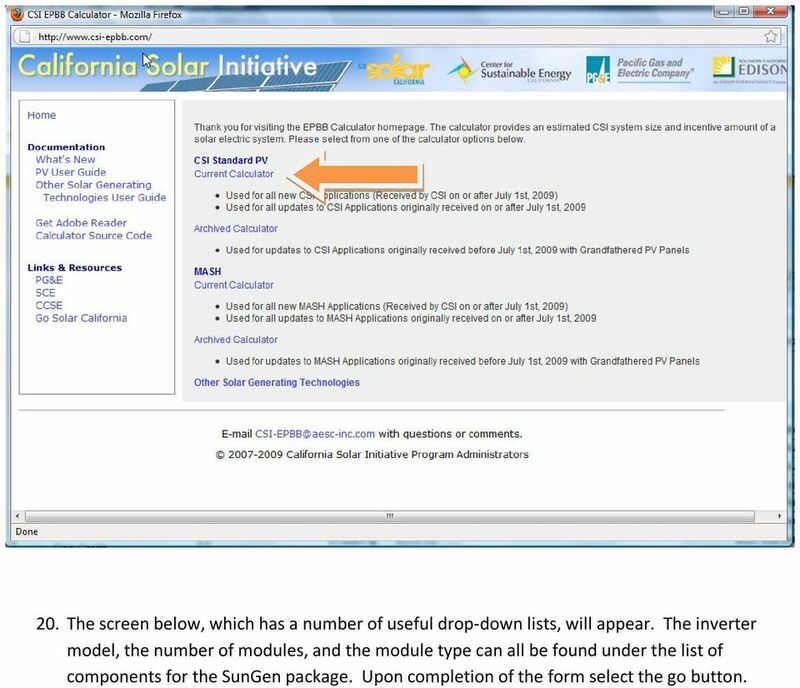 The inverter model, the number of modules, and the module type can all be found under the list of components for the SunGen package. Upon completion of the form select the go button. 12 21. Make sure to accurately input the data which corresponds to each section. 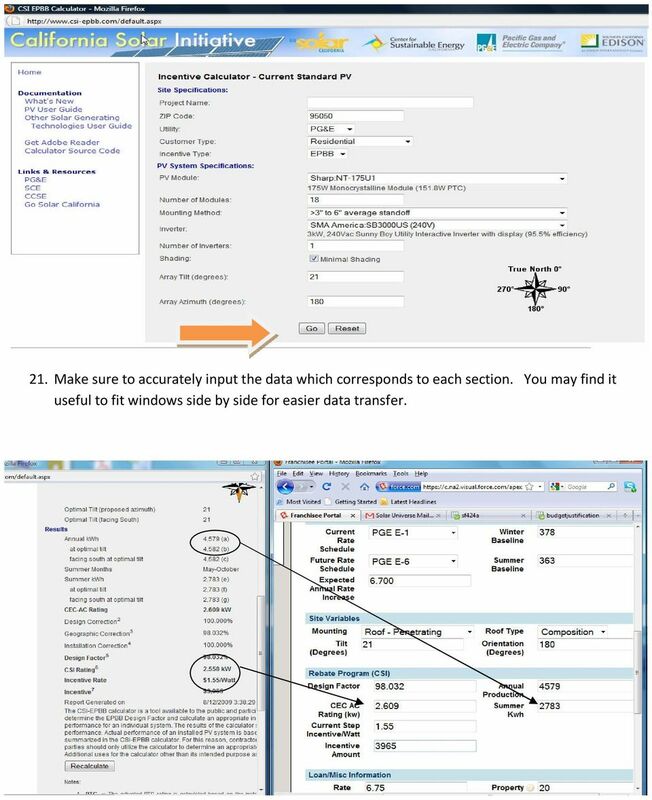 You may find it useful to fit windows side by side for easier data transfer. 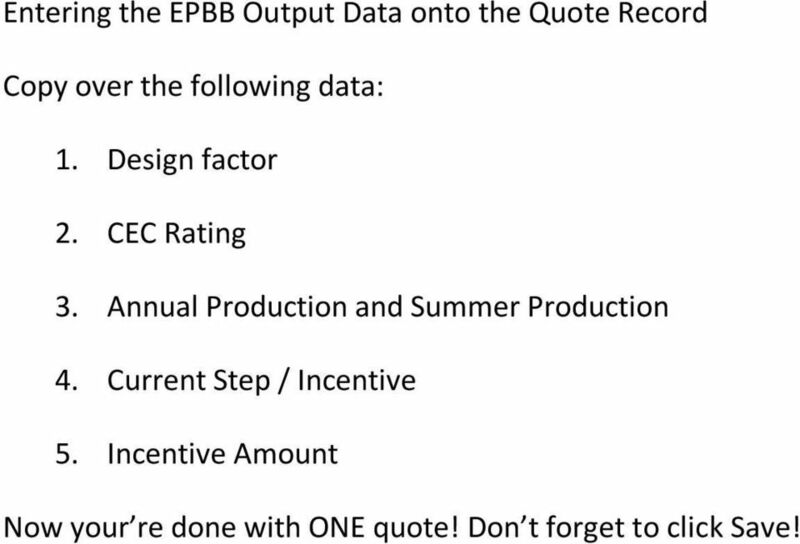 13 Entering the EPBB Output Data onto the Quote Record Copy over the following data: 1. Design factor 2. CEC Rating 3. Annual Production and Summer Production 4. Current Step / Incentive 5. Incentive Amount Now your re done with ONE quote! Don t forget to click Save! 14 Creating a 2 nd and 3 rd Quote by Cloning the Quote 22. Once you have completed your first quote, the 2 nd and 3 rd quotes go much faster. We recommend you make three proposals consisting of a 50, 75, and a 100 percent bill offset. 23. To clone a quote follow these steps: a. Click the Clone Button b. 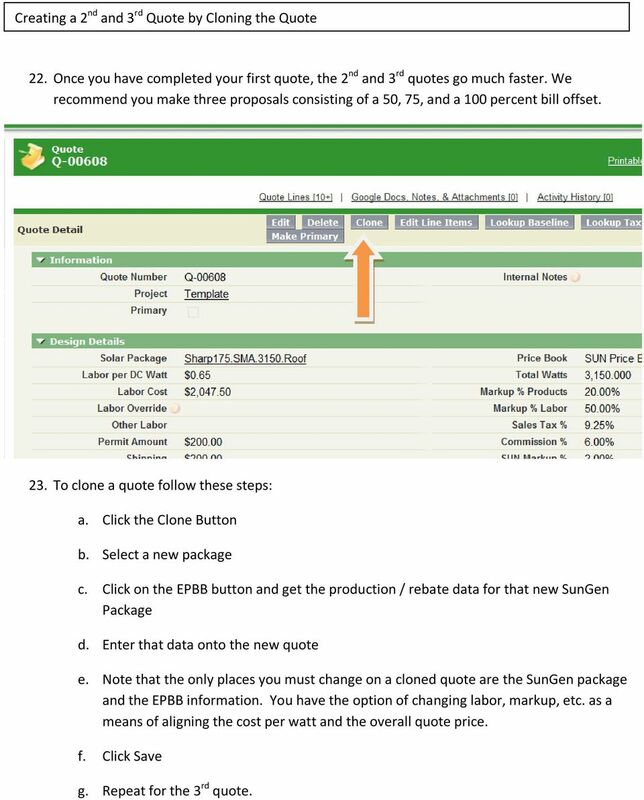 Select a new package c. Click on the EPBB button and get the production / rebate data for that new SunGen Package d. Enter that data onto the new quote e. Note that the only places you must change on a cloned quote are the SunGen package and the EPBB information. You have the option of changing labor, markup, etc. as a means of aligning the cost per watt and the overall quote price. f. Click Save g. Repeat for the 3 rd quote. 16 3. 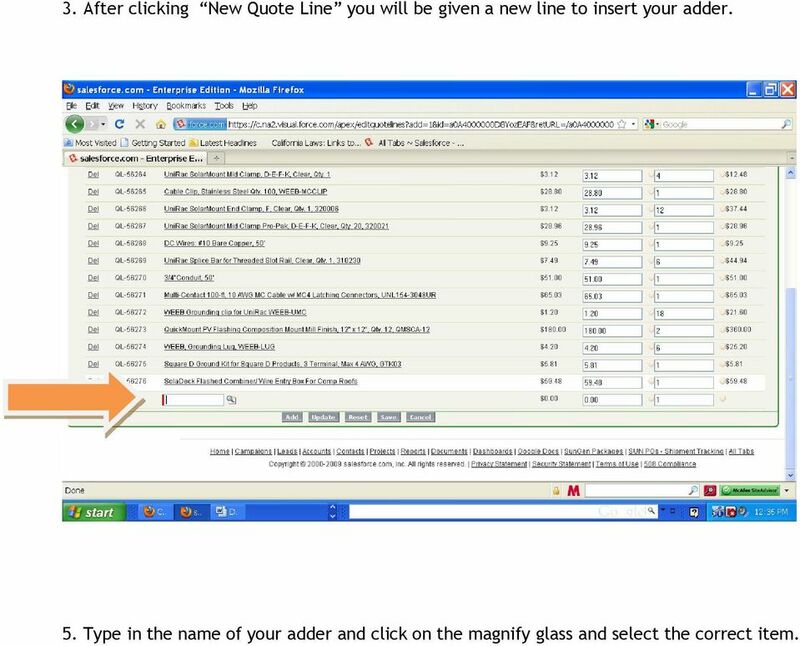 After clicking New Quote Line you will be given a new line to insert your adder. 5. Type in the name of your adder and click on the magnify glass and select the correct item. 17 6. Add your new line and update the quantity. 20 Publishing the Quote 24. Now that all 3 of the quotes are done, go to the PROJECT record. 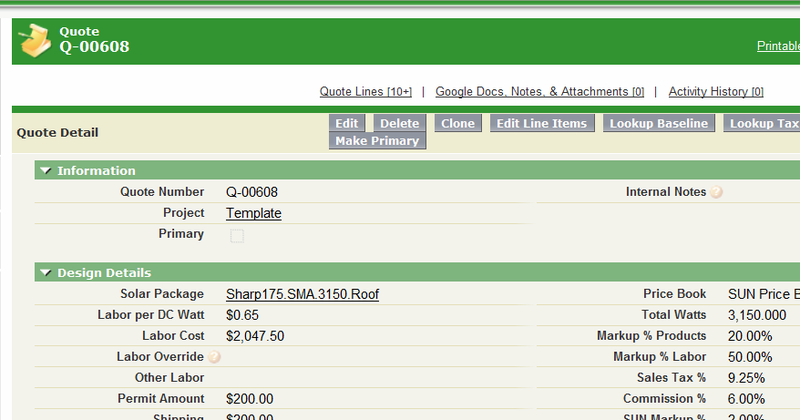 On the project record, click on the publish quote button. 25. 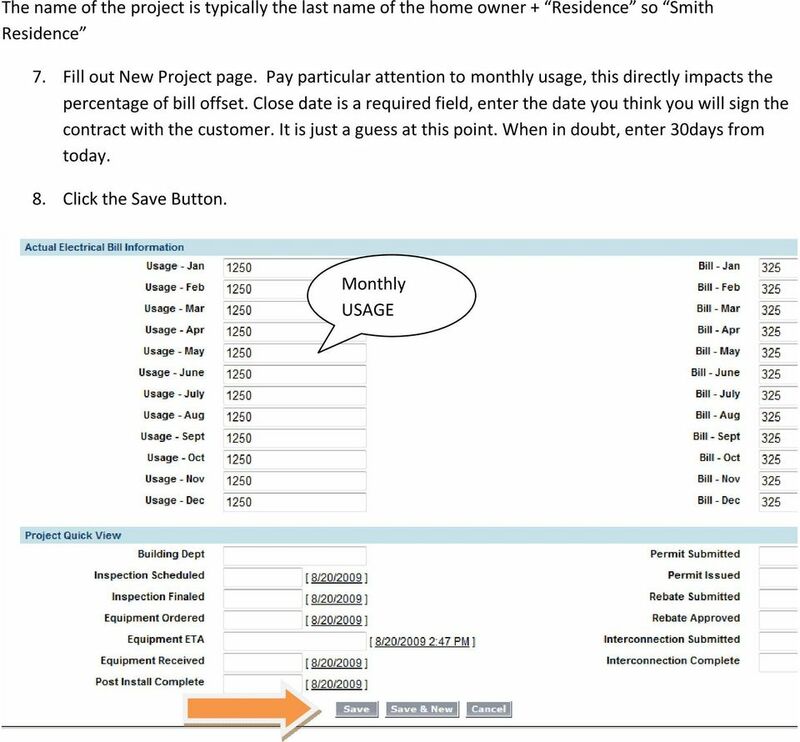 This will open up a new browser window which will display the formatted proposal, complete with the before and after savings calculations, etc. 26. Check/verify the data on the quote. Does it look right? Is it ready to send? 22 Understanding your SunQuote 29. It is important to familiarize yourself with the main areas of the SunQuote; Net Investment, Our Calculations, and Terms and Conditions. 23 30. The Net Investment section compares payback period, cost of financing, percentage of bill and usage offset, and the overall cost of the three systems. 24 31. 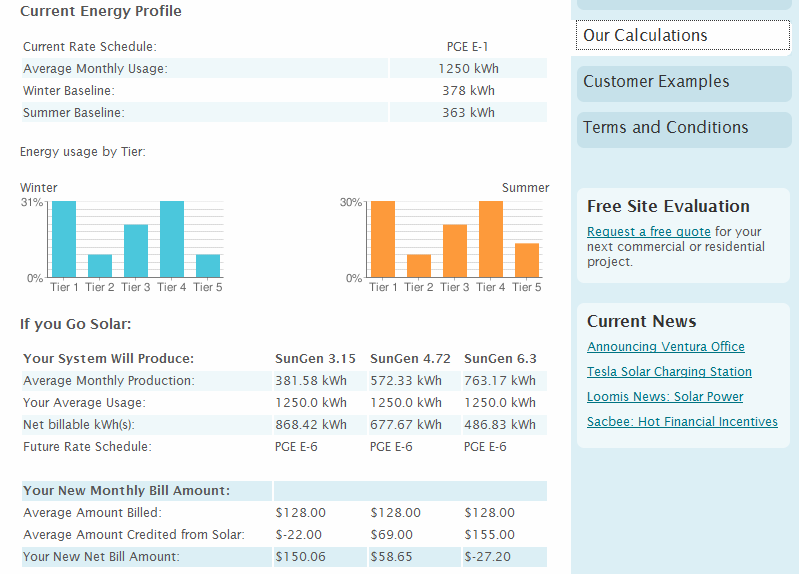 The Calculations page breaks down the customer s monthly usage and the KWh production of the three systems. 25 32. 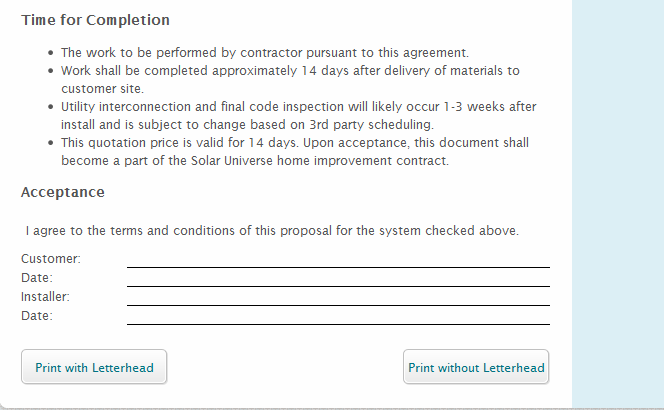 The Terms and Conditions page provides information regarding the components and output of each system, as well as the costs associated with each one. 26 Printing your Quote 33. In order to assure the highest quality proposals we have pre-printed letterhead available. 34. As you can see on the following slide there are two options when printing the SunQuote. The print option is located at the bottom of the Terms and Conditions page. 35. To print, load the pre-printed letterhead into you printer, taking care that it is correctly oriented, and select the print with letterhead option. 36. If no letterhead is available you may choose to print without. We believe that the pre-printed letter head option will provide a more professional look to your proposal, resulting in more closed deals. Plumas Sierra Solar Rebate Program Guidebook 2015 Plumas Sierra Rural Electric Cooperative (PSREC) is offering rebates to encourage the installation of high quality solar photovoltaic (PV) systems in 2015. Are you interested in saving money while producing solar sourced energy? Are you someone whose house, business or land can t host solar panels? Thanks for your interest in going solar at one of our group off-site solar farms. 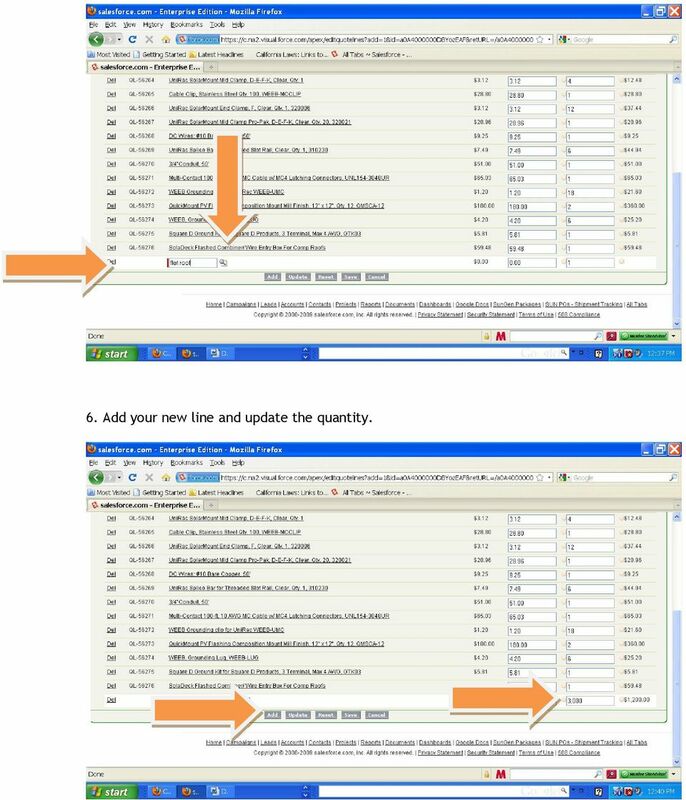 1 Browser Settings for Optimal Site Performance With the constant upgrades to browsers and to City National s systems, an occasional problem may develop with your browser and our program compatibility. Online Railway Reservation. Intel Easy Steps 1 2012 Intel Corporation All rights reserved. Important: Please follow regional 3M invoicing guidelines for one PO per invoice. How to Reset Your Password for the ONRR Data Warehouse Portal Audience This document is for all those who access the ONRR Data Warehouse Portal by starting at the following website: https://dwportal.mms.gov/.